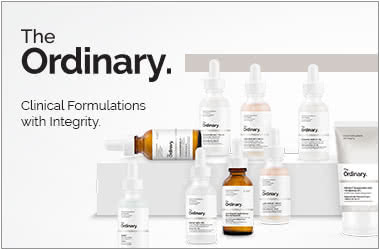 The Ordinary by Deciem has built a reputation as being a no-frills, high-performance skincare brand, developing and releasing effective products with low price tags. However, the brand does not just offer high-quality skincare. It also offers a small selection of makeup products that work as hybrids between makeup and skincare. The Ordinary makeup range currently consists of two foundations and two primers, designed to tackle different skincare concerns and target different skin types. Creating your makeup base has never been easier than with The Ordinary. Whether you want a primer for oily skin or a foundation with a dewy finish, The Ordinary has the makeup for you. A makeup primer offers many benefits, yet it is a step that is often skipped. Primers can help to create a barrier between the skin and foundation, providing a base for your makeup to glide onto. A good primer can also help to smooth fine lines and blur pores for the perfect foundation canvas. Furthermore, primers increase the longevity of makeup by helping it adhere to the skin more easily. Finally, a primer can also help tackle your skincare concerns. Someone with dry skin may use a hydrating primer, whilst someone with oily skin may benefit from a mattifying primer. Both of the primers available from The Ordinary are silicone-based formulations. Silicones are highly popular in skincare and makeup, as they help to blur the skin and minimise the appearance of pores. As well as improving skin texture, silicones can help to control oil levels and prevent foundation from becoming blotchy or fading throughout the day. The Ordinary High-Adherence Silicone Primer has been developed with oily skin in mind. This primer provides a matte finish, which is perfect for those with oily complexions. High-Adherence Silicone Primer also helps to minimise and blur pores for a flawless finish. The silicones ensure that makeup lasts all day on even the oiliest of complexions. If you have dry skin, choose The Ordinary High Spreadability Fluid Primer. This is a hydrating primer that helps to smooth the feel of dry skin for easier makeup application. The product’s lightweight, non-greasy texture allows skin to look naturally radiant dewy all day. The world waited eagerly when The Ordinary announced its development of foundations, a step further into the makeup world. With a waiting list going into the tens of thousands, Serum Foundation and Coverage Foundation were two of the most coveted releases of 2017. Just like skincare from The Ordinary, the brand’s foundations did not disappoint. These makeups are admired for their long-lasting and nourishing formulations, and their affordable price tag. There are many differences between the formulations of the two foundations, as they suit different skin types and tastes. Coverage Foundation gives natural-looking, full coverage that lasts all day. With a pigment-rich formula, it covers dark spots and blotches without appearing or feeling heavy on the skin. This foundation dries to a semi-matte finish without settling into fine lines and wrinkles. Serum Foundation also offers a semi-matte finish, but light-to-medium buildable coverage instead. This product has a super-lightweight serum feel. Which foundation is suited for which skin type? Coverage Foundation has been developed for those with an oily, acne-prone complexion. This makeup provides greater coverage of blemishes and scarring. Serum Foundation is much better for drier skin types, as it feels lightweight and hydrating on the skin. This primer did have good adherence, especially if you wore setting spray on top of the makeup. Lasted full 10 hour days of work for me. The formula was quite moisturising also, however sometimes left my skin feeling a little greasy/slippery. I didn't like this primer for a few reasons. The first was that I found that it made my face significantly oilier than normal (which being oily, wasn't welcome). The second was, no matter what I did, I could never get my foundation to blend smoothly on top of it. I always found it getting streaky, wouldn't stick at all, and even when I was trying to powder it down, my foundation would slide right off, which is not a problem I have ever had before, bare-skinned or not. The one good thing about it that I definitely can attest to, is that it's ridiculously smoothing, so if you want a smooth canvas, you really can't object at this price point. This foundation is great especially for the price. It doesn't live up to most of the more expensive foundations I have used but for something with a wide colour range and a ridiculous price point it's a really nice 'no brainer, slap it on' sort of product. I bought the coverage foundation in the same shade and they are nice worn together.